Celebrate a long Ascension weekend with this Ascension offer. Getting away with Ascension? Enjoy a wonderful long weekend at Familiecamping De Kleine Wielen! Ascension is the ideal opportunity to get away from it for a few days. The chance of good weather is great, nature is fully in bloom again and the days are getting longer. Take a leisurely walk or bike ride through nature reserve “De Groene Ster” throw your fishing rod in the fishing water of the “Lytse Wielen” or visit Leeuwarden. Leeuwarden is Cultural Capital of 2018 and that means that there will be organized a lot for young and old. 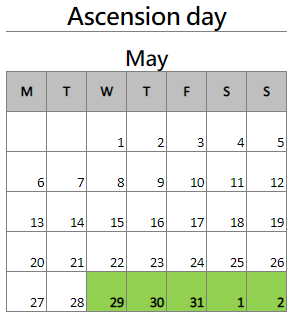 Have you already made plans for your free days around Ascension? Book your spot directly online! You book the Ascension offer from € 90,- for 2 persons. You can stay at the campsite for this period from 29 may to 2 July 2019. Taking extra persons or a pet? The online booking system calculates the new price for you.